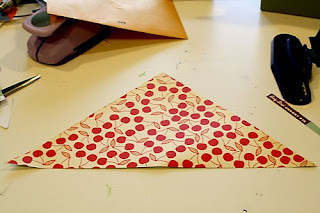 I posted this tutorial on the Studio Calico blog, but wanted to share it here too. 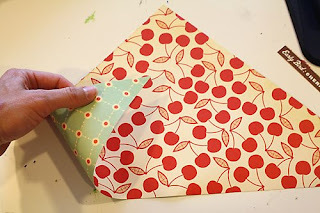 This Tussie Mussie tutorial is picture heavy, so I've split it into two posts. In their current form, tussie mussies rose to popularity during the reign of Queen Victoria , from 1837 onwards, at which time the tussie-mussie became a popular fashion accessory . 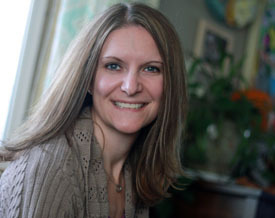 Typically, tussie-mussies include floral symbolism from the language of flowers , and therefore may be used to send a message to the recipient. 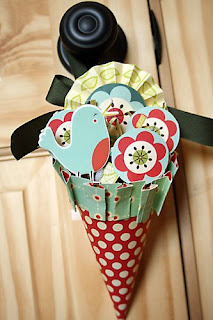 Usually they are made using real flowers, a nosegay is another term for them, but we crafters like to try everything using paper. There are many different ways of making tussie mussies, but I wanted to give you a little pictorial on how I created mine, as it is difficult to explain. This is my ode to Cosmo. I love the Early Bird line from Cosmo Cricket like I haven't loved a paper line before, lol. 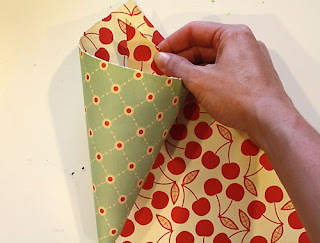 Trim a 12x12 piece of cardstock in half, diagonally. Step 2. Lay it out as pictured below, with the point facing away from you. Step 3. It didn't occur to me until just now, but most of you will do the opposite of what I'm doing right here. I'm a lefty, so I folded from the left side. 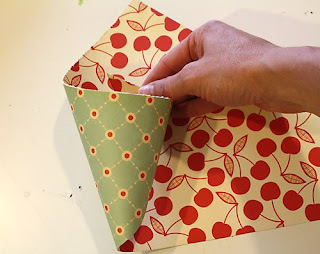 You want the bottom to close in tight, and for the top of your paper to meet the top of the triangle in the back of the cone. Once it has done so, adhere. 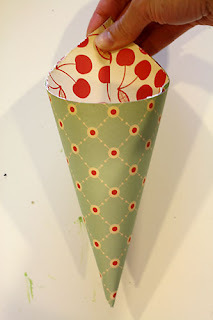 After you have adhered that side, take the paper on the right side and wrap it around the front of your cone. It should meet up on the back side of the cone in the same way as the front. Adhere it in the back. You now have the base of your cone. Part 2, embellishing. 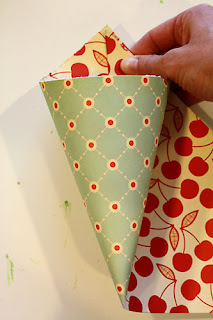 Thank you, I have always wanted to know how to make that cone shape, but never felt like sitting down to figure it all out. i appreciate your tutorial and plan on trying it out tonight! I love it! Thank you so much for your step by step!